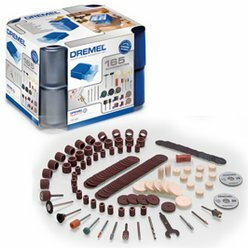 This 165 piece Multipurpose Dremel Accessory Set contains an extended collection of genuine Dremel accessories (including EZ SpeedClic). With accessories from all categories, this set gives you the ability to work on numerous different projects and materials with your Dremel. These accessories are packed in two high quality storage cases. These modular storage cases can be connected to similar Dremel storage cases, to create and expand your own storage system.